My in-laws booked a villa in Poland for the family vacation, and I found out too late they already paid half of the price by a bank transfer. Apart from the bank transfer itself I didn't find any red flags but nothing strongly supportive of the venue's legitimacy either. They have a website, are listed on Booking.com, and the only review on Google Maps is by the owner. I read in the comments here that payment by bank transfer is not unheard of in Europe when renting directly from a landlord. The owner has been corresponding with us, is responsive and has decent English. He sent us a rental agreement to sign but I have no idea if it would hold for us in a Polish court. I did not read it. Overall it does appear like this is just some family's country house which they figured they could now rent as rural Poland is gaining popularity among tourists. Am I overreacting? My in-laws want to pay the full price in advance to get a lower fare but I am definitely against that. Do I have any more methods to verify this rental is legit? Post-travel edit: The rental was genuine, the owner is a lovely person and we thoroughly enjoyed our vacation. By now the place has multiple reviews on Google Maps (including mine). Hopefully this makes it clear it is legitimate for future skeptics who read too many questions tagged 'scam' on SE sites. It is VERY popular in Poland that you book accommodation directly with the landlord via email or a phone. Most of so called "private accommodation" (kwatery prywatne) are not listed on booking.com or airbnb, because prices in Poland are still quite low and the fees would increase it. The website looks legitimate, so I'd say there's no big risk. On the other hand, from my experience, you usually don't pay full price in advance, but rather something around 20-30%, and you pay the rest upon arrival. According to the wayback machine, the contact number for this site in 2013 was +48 666 111 001 which is the same as it is today. They were also renting out the place in 2013 and have the same photos. If you call that number and get to speak to someone who you can confirm is the same person the booking was made with, I'd be pretty confident it's not a scam. To do so would have to be quite a sophisticated operation taking over both the site and phone number. At least the most telltale warning signs are missing. 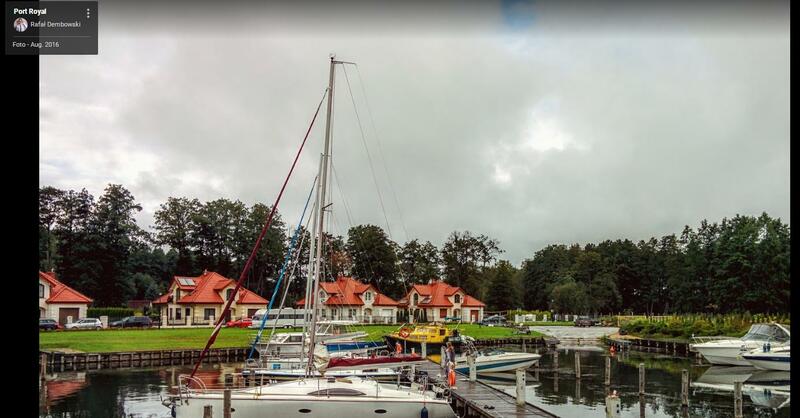 First, it contains Polish, German and English which is to be expected because Germans are one of the main tourists (and Masuria is really beautiful). The German is very good and I can say from experience that scammers have severe problems with it. The address seems also to be correct, the Hotel Europa has the Aleja Wojska Polskiego 37 which fits. The phone number is a typical Polish mobile phone number. And yes, it looks exactly like the photos from the website. So currently I do not see any reason that it is a scam. I find it interesting that you consider "the bank transfer itself" to be a "Red Flag". In my opinion, that is the result of media attention on the bad instead of the good. I tried fairly exhaustively to prove this theory but it's a tough dataset to gather (partly because most authorities don't like to advertise criminal success), so I couldn't get enough solid data to quote a fact except for a single year's data for the UK, where only about one out of every million pounds were transferred fraudulently. The next thought that jumped to mind, that wasn't clear from the question, is, initially, "who approached whom"? If your family found this villa advertised somewhere, or perhaps heard of it through word-of-mouth, that's a lot less likely to be a scam, compared to if they received a "random nighttime phone call from a stranger" offering them "the deal of the century". I checked out the links you included and (in my limited experience) the palce seemed as legitimate as any other (although it's silly that Google allows a sole review to be the owner), but then I had an idea to confirm. Unfortunately you didn't specify the date range that your family booked, because I was hoping to contact the villa before writing this post, and try to book the villa during the same period that your family has it booked! I'd say that if he turned me away, that's a pretty good indicator that there's is no fraudulent activity. I can't imagine a fraudster replying with, "I'm sorry, we're already scamming someone during that time frame." Keep in mind, your question here has been viewed 4000 times in 14 hours, and there's still a lot more time before the date of travel, so this post is likely rising towards up the list of Google Search results for the villa! 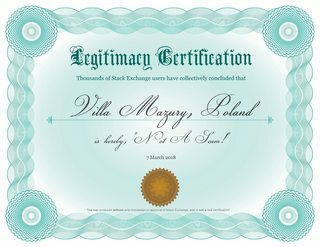 I live in the Czech Republic, and using bank transfers to rent out a villa is pretty normal here. One idea I haven't seen in the above answers is to find out who owns the property being rented. If you know someone who speaks Polish, a quick Google search found this website, with useful links: http://www.migrant.info.pl/land-and-mortgage-register.html You would need to know exactly where the property is, which should be doable from an online map service. 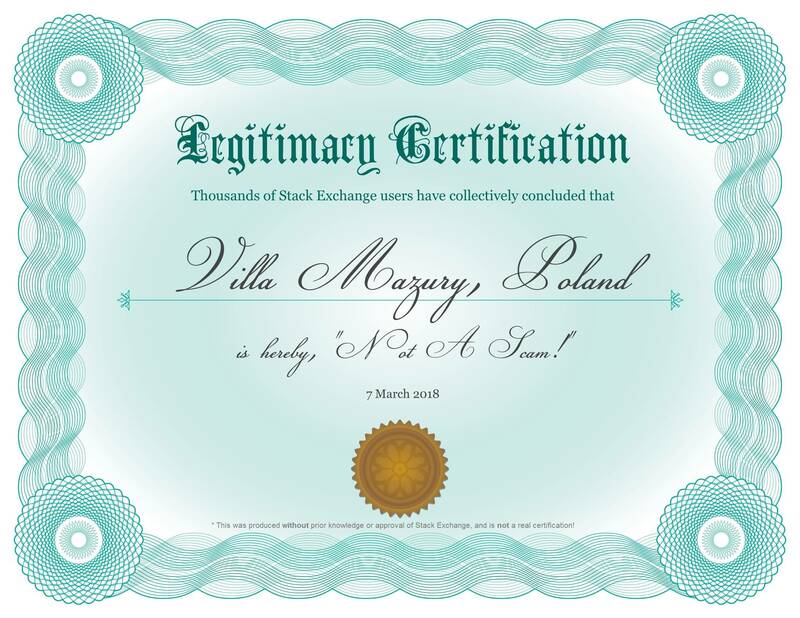 If the owner has the same name (or at least surname) as the person renting the villa, you can be more confident in their legitimacy. Not the answer you're looking for? Browse other questions tagged poland rental scams or ask your own question.